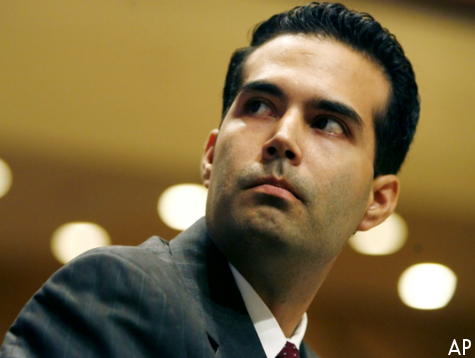 AUSTIN, Texas — George P. Bush, the Republican nominee for Texas Land Commissioner, gave an interview recently to Neena Satija of the Texas Tribune, in an article that also ran in the New York Times as part of their partnership with the Tribune. In the article, Bush was portrayed as taking a more moderate position on climate change than the standard Republican position. However, as shown by Satija’s own transcript and exclusive Breitbart Texas interviews with the campaign, Bush’s comments and positions have been seriously misrepresented. The article, titled “On Climate, a Younger Bush’s Ideas Stray From Party Ideology,” was the result of an interview request that Satija had sent to the campaign. Bush campaign staffers told Breitbart Texas that the candidate gets at least six to seven media requests a day. The majority are unrelated to any topic remotely related to the work of the Texas General Land Office (GLO), asking endless questions about his political family and national or foreign policy topics far removed from the duties of the Texas Land Commissioner. Consequently, when Satija contacted the campaign and told them she wanted to interview Bush about energy, environmental, and land use issues, they were receptive. Unfortunately, what ended up happening was the reporter had a singular focus on a favorite topic of hers, took several of Bush’s comments out of context, and mischaracterized others. For starters, the younger Mr. Bush thinks climate change is a serious threat to Texas, though he stopped short of definitively attributing a hotter and drier state to human activity. “I think people can agree that there has been warming in recent years,” Mr. Bush, a 38-year-old energy consultant, said. A Texas Republican candidate calling climate change a “serious threat to Texas” and something that “honestly keeps me up at night” is certainly a departure from traditional Republican ideology. However, the story told by the “edited for length and clarity” transcript of the interview posted by the Tribune tells a far different story. For starters, Bush never attributes sea-level rise or coastal erosion to climate change. He remarks that Texas is facing challenges with coastal erosion in several areas, and discusses ways to help fight it, but does not state a cause for the erosion. Similarly, with the issue of sea-level rise, Satija asks Bush if he would support Texas conducting “a comprehensive study on the effects of sea-level rise on the Gulf Coast,” but again, a causal relationship to climate change is completely absent from Bush’s remarks. Bush is clearly talking about disaster recovery issues here, and not climate change, citing two examples–hurricanes and oil spills–that relate to work of the GLO. In fact, this is a common issue throughout the interview, where Bush discusses land use and energy issues that would be part of his duties if he is elected Land Commissioner, and Satija repeatedly asks about climate change. She is the one who introduces the topic and asks him about it in at least four separate questions. Just like the previous example of what “keeps him up at night,” the transcript shows that Bush was not advocating for moving away from coal because of “concerns about global warming.” Instead, Bush points out that the EPA has been increasing its regulatory interference with coal and this government action is making coal less competitive. Moreover, the vast stores of natural gas in Texas mean that it makes perfect logical sense for a Texas Land Commissioner candidate to promote natural gas as an alterative to coal, as Bush does in the interview. As Breitbart Texas has reported, “fracking” and other developments have led to a boom in Texas’ oil and gas industry beyond even the most optimistic expectations. This year, Texas’ energy output is expected to exceed that of every oil-producing country in the Middle East except Saudi Arabia. Satija’s article also attempts to paint a picture of Bush as at odds with Texas Attorney General Greg Abbott’s campaign for Governor. Sources with both the Bush and Abbott campaigns told Breitbart Texas that Satija had called Abbott’s communications director, Matt Hirsch, for a comment for her article, but her portrayal of Bush’s positions on climate change seemed so far off base from what Hirsch knew, he refused to give her a quote. Both campaigns also expressly denied that their candidates had a dispute on this, or for that matter, any major issue. Allison DeFoor, who worked as an environmental adviser to Jeb Bush while he was governor of Florida, said he was not surprised to hear of the younger Mr. Bush’s opinions, adding that his father chose data over ideology. Breitbart Texas called DeFoor and he stated that he actually “knows nothing” about George P. Bush’s positions on climate change, and that he had told Satija that fact, so it was inaccurate to say he said he was not surprised. “She extrapolated rather strongly from what I said,” DeFoor said, telling how she had asked him the same questions “over and over.” He told Satija that he “hadn’t seen George P. since he was a little boy,” but from working with Jeb Bush, DeFoor remembered how the elder Bush was very detail -oriented and analytical. “My quote is 100% accurate,” said DeFoor, referring to his statement that it made sense that George P. Bush would take after his father in being data-driven in terms of policy positions. “[But] any characterizations are unauthorized and exceed anything that I said,” he added.